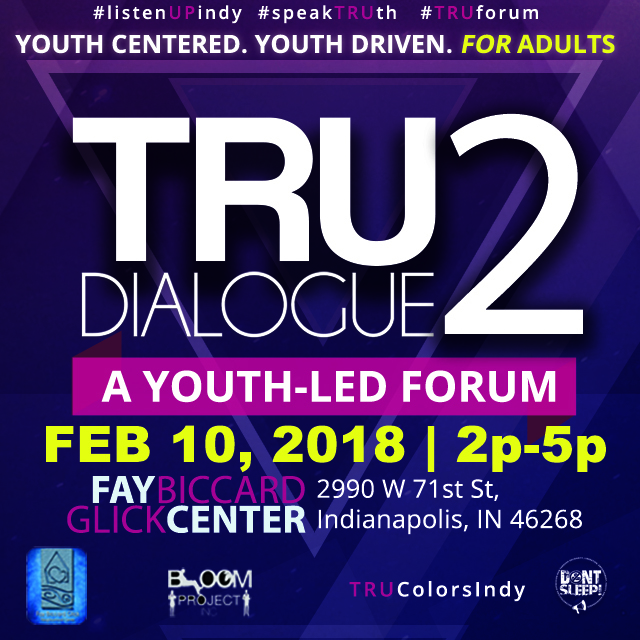 Indianapolis, In (February 3, 2018) – Bloom Project Inc., DONT SLEEP, Fay Biccard Glick Neighborhood Center, and Tru Colors join together to provide a platform for some of the most profound Indianapolis youth to speak to youth mentors, policy makers, and law enforcement that impact youth. In Indianapolis, there is an overwhelming amount of victimization occurring towards our young citizens. In addition, new legislative policies, education policies and corporate code of ethic policies put in place at times implement unfair treatment and discrimination towards youth, to this end, it has become imperative that we focus on hearing youth input and ideas that foster better relationships. To foster better relationships between youth and political leaders, the coalition of organizations created the Tru Dialogue Pt.2: A Youth-Led Forum. Tru Dialogue is a youth led and youth driven panel discussion, geared to offer an opportunity for the young people of Indianapolis to demonstrate their power….Through their voice. The premise is that for true dialogue to exist, there needs to be greater understanding from the perspective of those most marginalized, in hopes that cross-generational synergy can produce answers to the significant challenges we face as a city. The Tru Dialogue Pt.2 : A youth-led forum is Saturday, February 10, 2:30pm-5:00pm at Fay Biccard Glick Neighborhood Center (2990 W. 71st St, Indianapolis, IN 46268) doors open at 2pm. For more information on the event, please contact Arnetta Scruggs by email: arnetta@bloomprojectinc.org or by phone 317.758.8531.